Baja California Sur, the paradise between the waters. Red desert and blue water provide a stunning contrast and symbolises life here in Baja where everything has its opposite. There are nearly 3000 marine species in the Sea of Cortez and this biological wealth and diversity has lead it to be considered one of the leading destinations worldwide for diving and adventuring. The Sea of Cortez has a vast amount of different nudibranchs, blennies, jawfish, whales, a variety of rays and sharks, schools of fish, eels, octopus, sea horses, sea lions... the list goes on and on. The season that you are here (and luck!) will define some of the species you may encounter whilst others are here year round. It is a dynamic destination that offers a wide variety of dive sites, where heart stopping underwater encounters await you in waters surrounding the uninhabited wind swept islands along the coast. We have a variety of sites to visit from rocky reefs to shipwrecks to underwater art installations, all rich with a variety of life. 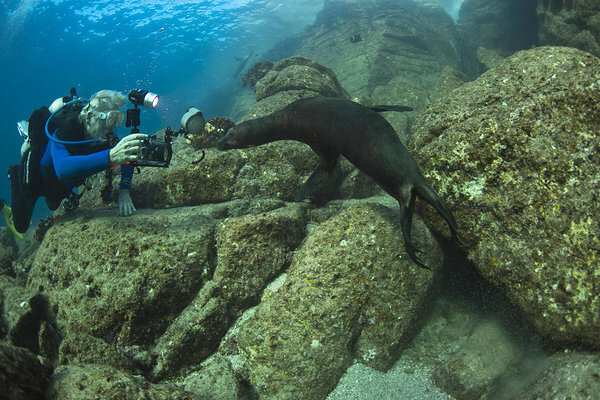 A dive site where you are guaranteed to encounter sea lions! This rock protruding from the ocean is home to a colony of over 300 sea lions. Whilst these playful creatures are the star attraction, the other marine life here is also healthy and diverse. You may also encounter mobula rays at this site, depending upon the season. There are often schools of migratory fish such as barracuda. During June and July, you can see the newborn sea lion babies on the rock, but they become more playful from November as they get a little older and bolder. 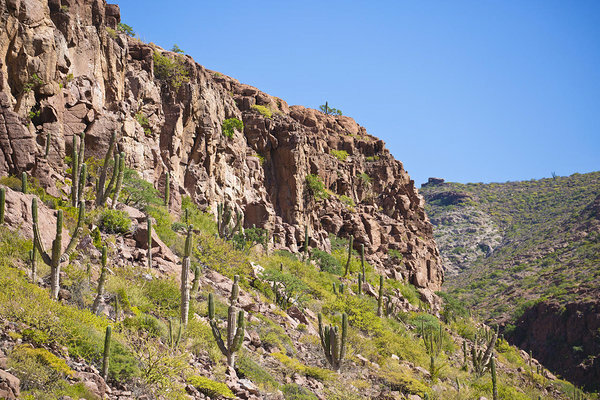 On land the scenery is varied with coastal desert plains to inland mountains and canyons. The climate is dry and arid. The ecology here is considered relatively young, the penisula having broken away from the mainland about 2 million years ago but it includes many endemic species. Vegetation here is limited to desert dwelling plants in lower coastal regions, which include the worlds largest cactus, and at higher elevations there is pine and holm oak forest. This allows for a diversity in bird, mammal and reptile life to be found around the state. The islands that you may chose to explore have stunning features and beautiful colours - a photographers paradise - and you can learn a little about the history of the area. Espiritu Santo is a favourite spot for first time visitors and locals alike; declared a Natural Protected Area by the federal government, the island is a valuable conservation area. Being uninhabited by humans it is a haven for divers and snorkelers who are seeking an adventure. Pristine beaches make a great lunch destination but it is the sea lion colony that is the real star here; inquisitive and playful in the water, snorkelling and diving with these creatures is a truly amazing experience. The town of La Paz is an authentic Mexican city, and the largest in the state of Baja California Sur. It is typically dry and sunny with an average temperature of 24-33 degrees Celsius. It is warmer in summer and cooler in winter and the bay helps to protect against seasonal storms. It is definitely worth leaving a day or two either side of your trip to explore the city with its colonial architecture, beautiful malecon, shops and great restaurants.